These lines are the chorus of a really lively and encouraging song on the latest Mercy Me album. The song is titled Greater. It explores the fact that the Great One – Jesus Christ himself – lives in us by grace, through faith! From His perspective we are redeemed, we are fully accepted by Him, with all our guilt and pain. Though there are days we lose the battle, “grace says it doesn’t matter”. He is living in us and He is greater than the world that would condemn and discourage, and call us fools. I pray that your joy and strength may be renewed in the Lord as you sing along. Below you will find the lyric video, the story behind the song and the lyrics themselves. 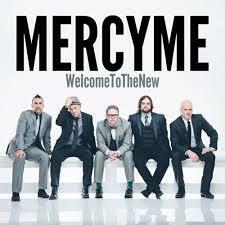 (If you don’t have a copy of the latest Mercy Me Album, this site says it is just 5.99 on iTunes for a limited time: http://mercyme.org/) Blessings to you! This entry was posted in Best Christian musicians, Contentment, Encouraging others, Glorifying God, Pure Grace, Song lyrics and tagged christianity, Church music, goodness and mercy, jesus the light of the world, Mercy Me, power of the holy spirit, spirituality. Bookmark the permalink. I love them! Wonderful song.